The best thing about being an adult is that we get to do things we couldn’t do when we were kids. Sometimes it’s because, as adults, we have the free choice to do what we want. Sometimes it’s because new technology gives us the opportunity to do something we never could have done before. In the case of dental veneers, it’s both. If you’d like to finally get that white, straight smile that you’ve always wanted, the team at Mid-Michigan Dental Excellence in Alma, MI, can help. With cosmetic dentistry, that smile you want, and a renewed sense of confidence, is just around the corner. Discolored teeth? Due to any number of reasons, including excessive fluoride or having taken tetracycline as a child, your teeth can lose their whiteness? Unsightly gaps between your teeth? Uneven or irregularly shaped teeth? If your smile suffers from any of these, then dental veneers could be the answer to your prayers. Unlike braces — traditional or clear aligners — dental veneers will let us fix the color and and any other imperfections at the same time. For example, normally with gaps in teeth, you would need an orthodontic treatment like braces or Red, White and Blue aligners to move teeth and close the gaps. Your dental veneers can be made just a little larger than the tooth they’ll bond with. This will close those small gaps. The same goes for teeth that may have crooked or irregular edges. Veneers can make them look even and straight. Cosmetic dentistry treatments change the way your teeth look, whereas restorative treatments restore function to your teeth. Dental veneers are a combination of both. Dental veneers are tooth-colored, wafer-thin shells that are designed to cover the front surface of your teeth. They are bonded to your natural teeth but are straighter and whiter than your teeth. Veneers can also correct some bite issues. If Dr. McDonald determines that you’re a good candidate for veneers, he may take X-rays and possibly make impressions of your teeth. The procedure will require him to remove a small portion of your enamel (about ½ millimeter). Since enamel doesn’t contain any nerve endings, this is a fairly painless process. He’ll take an impression of your mouth in order to get a mold for the restoration. You’ll wear a temporary veneer while your permanent one is being fabricated. The time varies, but it’s usually one to two weeks. Once your permanent veneer arrives, Dr. McDonald will place it on your teeth to examine its fit and color. If necessary, he will remove and trim the veneer until he gets the perfect fit. Next, your tooth or teeth will be prepared by cleaning. We’ll then bond the veneer or veneers onto your teeth using a high-strength bond. Once the veneer is placed, we will apply a special light to it which will activate the chemicals in the cement causing it to harden. The veneer will look and function like a real tooth. We may ask you to come back in in a couple of weeks just to re-examine the veneer’s placement and to make sure your gums are responding properly. 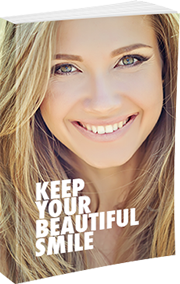 Your veneer should last for years if you properly maintain them. Dental veneers don’t require any special care. Just do what you would do with natural teeth — regularly brush, floss and rinse with an antiseptic mouthwash. They’re resistant to stains but you still want to avoid some stain-causing beverages like coffee or red wine. You only live once. Why live with teeth that are discolored or misshapen? The fastest way to get that high-wattage, movie-star smile is with dental veneers. All of those imperfections that you lived with for so long can be fixed. We’ll be happy to talk with you about veneers. Just give us a call at 989-796-4848 and we’ll set up an appointment for you. You can also send us a message using our online form and a member of our team will get back to you as soon as possible.